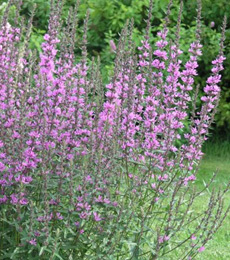 Lythrum is a perennial herb with a woody four-sided stem and whorled leaves. Plants are usually covered by a soft down. Leaves are generally opposite, lance-shaped but heart-shaped or rounded at the base. Mature plants can have 30 to 50 stems emerging from a single rootstock and produce as many as 3 millions seeds annually. Showy, trimorphic, magenta-coloured flowers, with five to seven petals, are produced throughout most of the summer. Woody stems of plants remain standing during the winter, when the plant is readily identified by its brownish colour and spiral-shaped capsule clusters.